1. To be able to preserve more of the food we grow. 2. To save money by buying in bulk, on sale or in season. Since buying our freezer, I’ve been tempted to just go out and buy lots of stuff to fill it, after all a full freezer is more cost effective than a partially full one. However, we are a on a budget and I want to stick too it. So our freezer is going to have to be filled a little more slowly than I’d like. We bought it at a great time though since there are so many awesome deals on food around the holiday season. We already had a 25 lb bag of oats and a lot of fruit that we froze over the summer to put in it, but we still have lots of room to spare. Since the growing season is pretty much over, I’m going to have to focus on buying in bulk and stocking up on sale items until the garden starts producing again next year. For example, I’ve been buying lots of butter @ 1.69 lb and chocolate chips @ 1.19 per bag because they both freeze well and this is probably the lowest they are going to be in my area. I also bought several bags of onions for .69 each and a 5.5 lb tub of ground beef @ 2.29 per lb because these are great prices and they both freeze well. I spent the morning chopping onions and cooking ground beef so now I have the prep work done for many dinners to come! I froze 5 chopped onions per bag and 1 lb ground beef per bag. Two lbs of the ground beef I made into taco meat. 2. Put onions in the fridge 30 minutes before chopping to lesson the burning eye effect. 3. Double bag onions so they don’t make your freezer smell. I’m also making a huge pot of beans for dinner tonight and I anticipate having lots of leftovers to freeze for burritos, chili, soups, etc. Go here to learn how to freeze cooked beans. I will continue to stock up on sale items and probably make some freezer meals once it gets closer to my due date. I’m so glad that we decided to buy a deep freeze. They can save you lots of money and also give you a peace of mind. 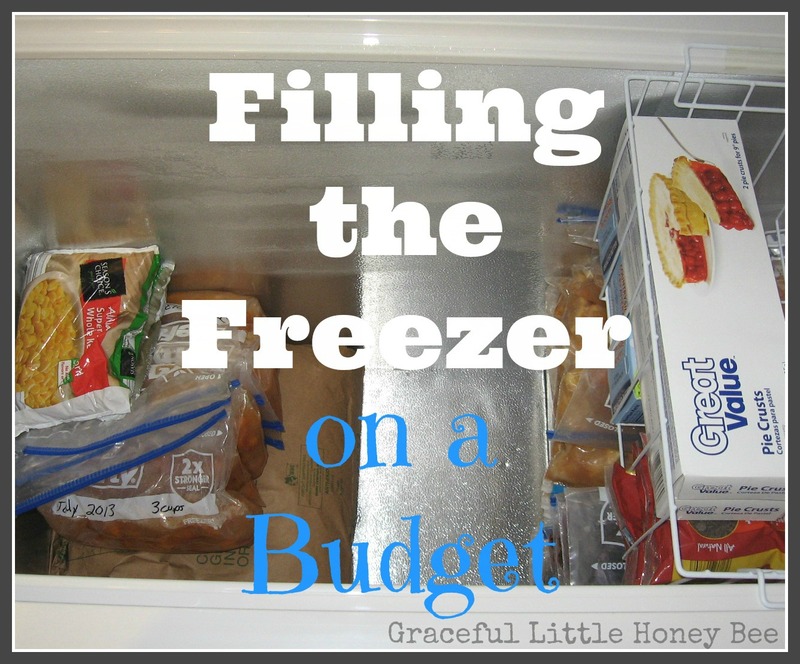 Do you use a freezer to save money? We LOVE our deep freeze too! My parents give us free beef from their cattle farm, so we definitely save a lot of money using it! We also store homemade applesauce, frozen corn, and our apple pies. It's so handy to be able to pull together quality meals during the heart of winter! When all of our children were home, I'd buy potatoes in 100# bags. We'd wash &/or peel and parboil them. Just as the water would begin to boil, we'd plunge them in ice water to stop the cooking process. We'd shred them and press with a hamburger press. Freeze in a single layer. Put wax paper between the patties and place in a freezer bag or box. They were great to make hash browns or to add to a casserole. An upright Food Saver Vacuum sealer is another great way to save money. When our chest freezer starts to get low, I fill up large containers (like milk jugs or orange juice containers) with water and place them in the freezer to take up space. As I have new items to stock the freezer with, I simply take out the "placeholders" as necessary and put in the new items. Keeps the freezer fuller so it is more efficient and in a pinch, the containers work well for keeping things cold in coolers too. To save money, we buy milk when it's on sale and freeze it. Also, I made crockpot yogurt and froze little batches to use at a later date (and as starters)! And, of course, meat, fruits and veggies from store, garden or picky our own farms. I made triple berry jam that was delicious, but all three berries used ripen at different times. I ended up picking strawberries and blueberries, putting them in the blender and then put them in the freezer until I was ready to pick the red raspberries in the fall to make the triple berry jam. This saved the house from heating up while I was making jam because I waited until September/October to can all my jam for the year! I freeze my milk so I don't need to visit the supermarket as often but I don't freeze veg as vegetables where I live trend to be quite cheap all the time. Answering the potato question--peel and cut the potatoes into ! inch cubes. Cover with water and bring to a boil. Boil about 8 minutes until softened but not completely. Drain and pour onto large baking sheets to cool. Bag them in Ziploc freezer bags in a single layer and freeze flat. To use remove from the freezer and just brown in a skillet in your choice of fat until hot and browned. They taste just like fresh. This is the only way I have served them. I have had good success with freezing fully prepared mashed potatoes too. I generally thaw those in the refrigerator and then reheat. Hi Missy! I don't know if you're into pressure canning, but that would be a good way to preserve your potatoes! Canned potatoes can be used for anything! Love this post! Thanks for sharing! Blessings from Bama! Hello, I found you on Women Living Well and wanted to mention how I freeze potatoes. My family loves twice baked potatoes and mashed potatoes. 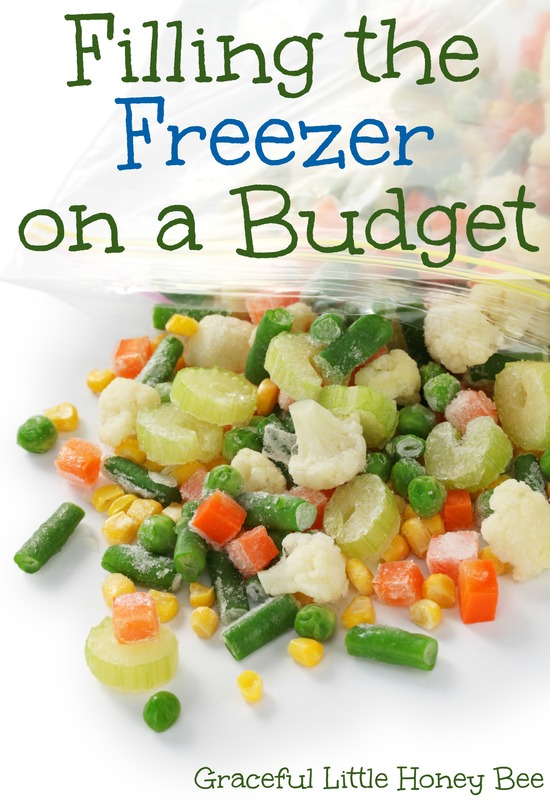 It's very easy to fill your freezer with both and very easy to thaw when adding to a meal. Also, I'm not sure how large your freezer is but I have learned that keeping a log of what is in the freezer is a good idea. I keep a clipboard on the wall near my freezer and mark off what I take out or add what I put inside. This will help you see what is in there and also helps you not forget the items at the very bottom; which is easy to do when your freezer is full. I freeze mashed potatoes in bags once they are cool, then thaw and reheat to serve. I also make twice baked potatoes and freeze them by laying them on a cookie sheet. Once frozen I place them in baggies. Parboiling potatoes and shredding them for hashbrowns, or cubing for homestyle makes for a quick addition to meals as well. Our store sometimes has 50# bags for $15, that is a great time to fill the freezer with potatoes. Consider a dehydrator. This was not a major purchase (yard sales have them all the time) & this year when the garden was in full swing I had two going at once. I bought an onion dicer (another yard sale find but the dollar stores have them) & dehydrated onions so I didn't have to use my precious freezer space. Can dehydrate potatoes also when on sale. I currently have a large supply of dehydrated tomatoes, onions, bell peppers, banana peppers, celery, & onions all from my garden or bought on sale. Ways to use the potatoes: Bake all the potatoes (heat the oven once, but get it all done), then peel the potatoes (I shred them up and give them to the worms, but I'm sure there's something else that a smart person could do with them). Now grate them, and put them in bags and in the freezer they good. They make better hash browns if they are pre-baked, all you have to do it heat them and then get a good golden crust going on. I just put 27 stuffed peppers in my freezer.I take out the amount i need for supper,partially thaw at room temperature then bake at 400 degrees for 30 to 45 minutes. Got the recipe over at Hickry Hollow farm blog, go check it out lots of info on freezing and canning! I can my potatoes to save space in freezer. What an awesome idea! I love Hickory Holler Farm! She has some great recipes! I have found that boiling potatoes before freezing makes them grainy sometimes. Here is what I do. I buy a ton of potatoes, place them all in the dishwasher (without soap) and run a cycle and they come out sparkling. Then I bake them. Some I bake in all my crock pots, roasters, and of course the oven...but just until I can pierce them easily. Then I either shred them or cube them. I sometimes leave the skins on and sometimes peel them depending on the use I intend for them later. The skin on cubes make great oven roasted potatoes with a little olive oil and seasoning, the skin off cubes make great potato salad, and even mashed potatoes, I just boil them and mash em! I do shreds for hashbrowns, and the unpeeled cubes are great for potato soup and other soups calling for potatoes, just add them at the end as they tend to fall apart a bit if overcooked. That is how I handle "tons" of potatoes!! I use my freezers for EVERYTHING! Preventing waste is one of my favorite tricks - if I buy a canned food item for a recipe and only use part of it, the rest gets frozen flat in ziplock bags. Have saved partial cans of beef broth, enchilada sauce, pumpkin, etc. this way. Leftover tomato paste gets frozen in ice cube trays then moved to bags. When bags of lemons or limes are cheap I'll wash the outsides, juice and freeze that in icecube trays - then freeze the empty rinds. You can either pull a frozen rind out to grate for frest zest or you can dehydrate them when you get around to it. After a trip to the discount bread store (for a certain type we really like and I can't duplicate at home yet) I'll throw the bags in the freezer. There is just SO much you can freeze - usually the hard part for me is finding space for it all! Wonderful post! learned so mush thanks for posting.